Soups are a statement on Mondays in my house. I find that it is a good way to start the week, give the body some rest and plenty of nutrients after a busy week-end! You can always supplement any of your soup with a cup of beans to add proteins and make it a more consistent meal! 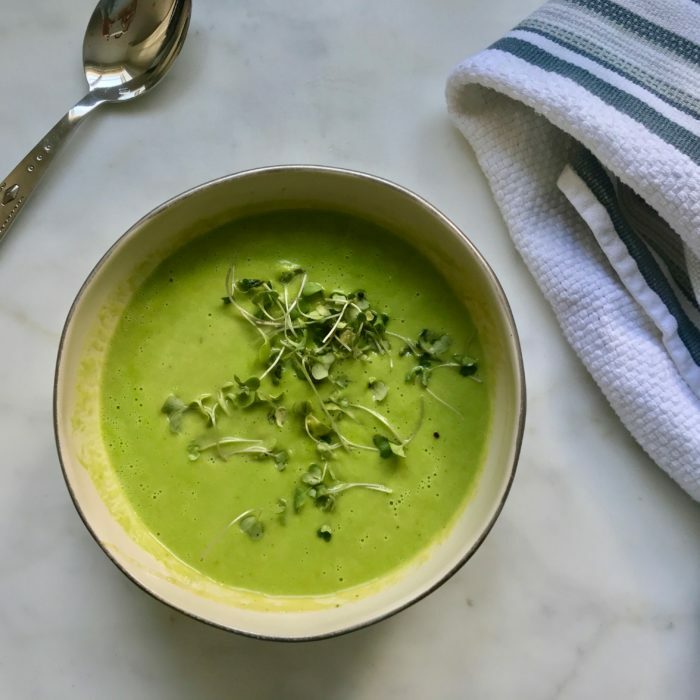 In my green soups I like to add raw spinach for super extra nutrients! This makes a perfect and delicious meal in exactly 20 minutes!!! Combine all the veggies in a large pot and sauté with some olive oil for a few minutes. Add the stock, some salt and pepper and bring to a boil. Cover and simmer for 7-10 minutes until veggies are tender and cooked. Transfer everything to a powerful bender and blend until completely smooth. Garnish with some sprouts or seeds, maybe a few croutons or crispy quinoa! Yayyyyy, thank you for sharing!